Sullivan Square Las Vegas developer sues Ireland investor for breach of contract to finance the mixed use real estate project for up to $800 million. Filed this week in the Clark Country District Court, the lawsuit alleges Harcourt Nevada failed to perform funding and breach of fiduciary duty. The attorney for Sullivan Square real estate in Las Vegas, Nevada said Patrick Doherty, principal of Harcourt, used Glen, Smith & Glen development to raise the condo project from ground breaking to vertical and then take control to finish. 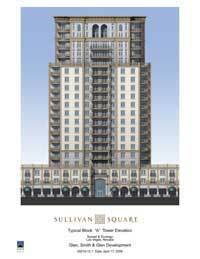 Liens and lawsuits have been building up against Sullivan Square condos. $2 million in back payment is owed to vendors and consultants. Another $2 million in eight liens and two lawsuits have been filed. Payments needed include SR Construction and Flack + Kurtz electrical and mechanical contractors. The urban luxury condos are located at Durango and the Las Vegas Beltway on 16 acres of land. The design includes 45,000 square feet of office and retail buildings, 1,300 residential units and a central park. Reservations for the units had been converted to binding contracts earlier this year after which the vertical construction of the first 152 unit tower was scheduled. An estimated $150 million was spent on the dynamite blasting for excavation and construction costs last year. Martin Harris Construction has been told they would start construction in three months and subcontractors would get paid, even though a guaranteed pricing schedule wasn’t finalized. Call 702-505-6988 for VIP Las Vegas Nevada real estate search by Las Vegas real estate agents. Sullivan Square Las Vegas developer sues Ireland investor for breach of contract.